I had the extremely fun privilege to work with Upswept Creative on a website rewrite recently. It was a special project because Sarah at Upswept is a talented writer. She wrote a blog post for my roller derby blog (many moons ago—what, I haven’t told you about my roller derby blog? ), and it was one of my most-read posts ever. There was no “bad” to edit out of this website. Just some refreshing, fine-tuning, and a couple of pages of new content to do. The language wasn’t reflecting the work they currently do, and what they wanted to do more of. They wanted to start working with larger companies, and filtering out prospects that don’t have the budget to take on a full-service design and branding firm. They had a new story to tell. When you write your own website copy, sometimes it’s hard to brag on yourself. Bringing in an outside professional with fresh eyes can clarify a new perspective. After all, you know your own story. It’s hard not to see it when you look at your website because your brain fills in the holes for you. However, your prospects can’t see the full picture unless you tell them about it. We had a long talk about the business, their goals, and what their dream clients look like. After we finalized the details of the project, I sent a questionnaire to clarify a few important points. I did some research about best practices for web design and branding companies. Writing/editing began in earnest! I started working on a couple of new pages to reflect their focus on design and branding, and refreshes on the other pages. After my first draft, it got sent off to the Upswept team. Everyone got a chance to review the new copy and make comments. We edited via Google Doc, with everyone able to chat in the comments. Once we chiseled away to a final version we all loved, I sent it away to an awesome proofreader. Even professionals get tired eyes when it comes to their own work. She bopped it on back to me minus some extraneous commas, and we were off and running. The copy is now live in the site. Go check it out! When we work together, it can look however makes sense to you. Do you want to get your entire team involved early in the process? Would you rather make the decisions yourself? Would you like to edit live, on a Zoom call, or over the course of a few days? I’m glad to make suggestions, but you call the shots on what works for your workflow. I went to Digital Summit Portland this week, and it was pretty cool, everyone. It’s all about digital marketing for people who are involved with all aspects of it, from content creation, to strategy, to back end… stuff. Whatever those people do with code. Small business writing is marketing. Great question! All content and copy is marketing. If you’re going to hire a writer, you’d better make sure that a) you have a strong marketing plan, or b) your writer has marketing skills to help you support your goals. That’s why I take every opportunity to keep up-to-date on online marketing, as well as to hone those writing chops. 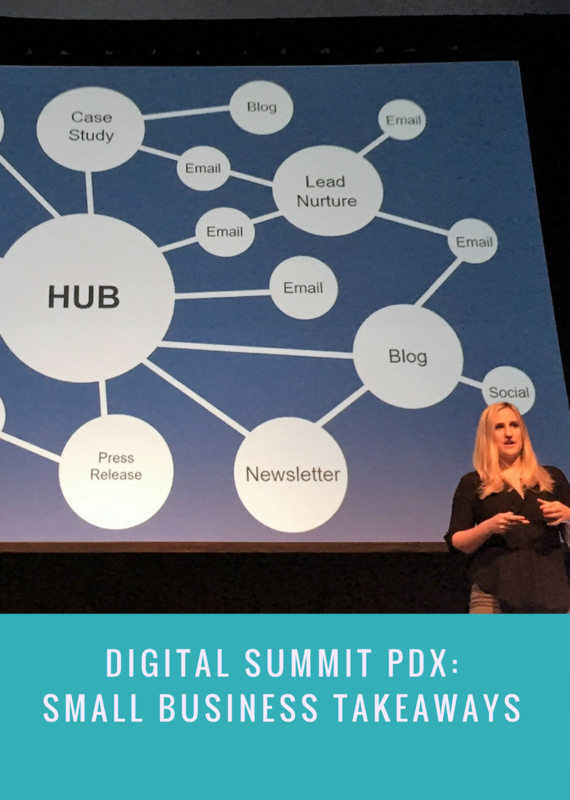 A lot of the presentations and programs at Digital Summit Portland were geared toward businesses that work on a larger scale than my clients. The email strategy for say, Home Depot, will be different than strategy for your home-based photography business. Still, there were some pretty cool things to think about and take away for anyone who’s making content or marketing online. Most of your consumers can see a pitch coming from a mile away. They want their brands to be authentic. To stand for something. To add real value to their lives. And if they get that from you? You might get a repeat customer who loves and supports your brand. Don’t be afraid to use your own voice. Make an action plan, but keep it agile. You need a content strategy plan. Even if it’s sketched out on a napkin and pinned onto a bulletin board — you won’t get results without knowing what the heck you’re supposed to be doing and, more importantly, WHY you’re doing it. Later, if something’s not getting the results you wanted, take another look. Tweak it if you still think it’s worthwhile, and scrap it if it’s not. Figure out who your customer is. Have you ever made customer personas? It’s a fairly common marketing practice. Say you have a brick-and-mortar boutique. A very basic persona might be “Jenny.” Jenny is a 37-year-old woman who lives in South Beaverton and has two girls ages 2 and 5. She’s married, owns her home, and works full-time in real estate. The new, hot thing? Mapping Customer Journeys. What steps does Jenny take before she becomes your customer? What else is she searching for on the internet? What’s the first time she hears about your business? Does she come into your store than once before she buys, or is she more impulsive? Does she look online first? How can you keep her as a customer after she walks out the door? When will she buy again? Whew, that’s a lot, and it can get even more complex. But thinking this way helps you nurture your leads throughout the process of buying, and in helping them become loyal customers who will buy again. There was a presentation that was based on Beyonce songs, so OBVIOUSLY I ATTENDED THAT ONE. Lessons learned from Beyonce? So many. Slay all the time. Get crazy in love with your customers. Be the best. Make it easy for your customers to love you. Make it easy to interact, and easy to get questions answered. No 30,000 unread emails or full voicemail boxes. Meet your customers where they want to interact with you. Make extra special customer experiences. Stand out and be unique, but make sure your customers can know what to expect when they interact with you. Empower your employees to go above and beyond. Train them and ask them what customers are saying. People like humor! It adds a bit of color to your clients’ lives, and helps you compete for attention against internet celebrity dogs. Dogs are really cute. Try adding a little humor into your copy and seeing how your customers respond. Most people get 7-24% increase in conversions with just a little joke. Let’s can work together on a content strategy that targets your ideal client. Email me, or book a consultation. Start getting more customers today. What’s special about your business? I’ve written for what we call editorial for a while—that’s content for publications, rather than for sales—and business profiles cross over the two disciplines. A casual reader of a magazine and a hot prospect who’s heading to your website both want the same thing: a hook. Most people who visit your website, or who flip through a magazine, aren’t going to give you much time. You need to get them interested quickly, or they might decide that whatever you’re offering isn’t for them. This can be visual, or text, but in an ideal world, visual design and copywriting work together to pique the reader’s interest. When you flip through this month’s NW Kids Magazine, you’ll see a picture of a cute baby holding a rather unusual bottle. If you have a baby, you might stop flipping, because this obviously is geared to you. Then, you’ll see the short story about how much my baby took to one of the spoons like bears to honey. If that interests you, you might move on to learn more about the company itself. What’s the hook on your home page? What will make your prospects want to learn more? Check out this example of a profile I did for NW Kids Magazine’s July 2017 issue. (Page 17, if you please.) Olababy is a local company that designs baby feeding gear: bottles, spoons, and these cool bowls that you can use to steam and serve. Okay, I haven’t actually tried to steam any food for *my* baby yet, despite the tasty peas in my garden that are about to give up the ghost. But those silicone spoons are a lifesaver. For this profile, I got some information from the PR company to review. Then, the two principals of the company were willing to chat on a conference call. Lucky for me, because one of them was in China at the time. Our Friday afternoon chat was a very early Saturday morning chat for him. A writer should come to the table with their own background research, and then figure out the tricky part—what’re the most important questions to ask? What do the customers really want to know? What’s missing? People think that writers just write, but the real work is in thinking through different angles. Finding an angle that gets the audience interested? That’s the fun part. Whether it’s a profile or an about page, let me help you tell your story. Shoot me an email today. Sometimes you need hard-hitting web copy. Writing about roller derby? Don’t mind if I do. If you gave me $100 to come up with a project that was more up my alley than this, I’d have a hard time coming up with something. After all, I literally wrote the book (okay, a book) about roller derby. Recently, I had the opportunity to work with Upswept Creative on the newly designed Cherry City Roller Derby website by writing and editing the web copy. I cleaned up some copy and wrote some sections from scratch. We collaborated a survey for stakeholders to find out that to include in the new site. They made the site beautiful and functional while I thought about how to communicate with all those people who use the site: skaters, fans, and sponsors. Check out Upswept Creative for brand design, rebranding, and website design in Portland, Oregon. They’re good people over there. Need user-friendly web copy for your tough-as-nails website? Drop me a line.